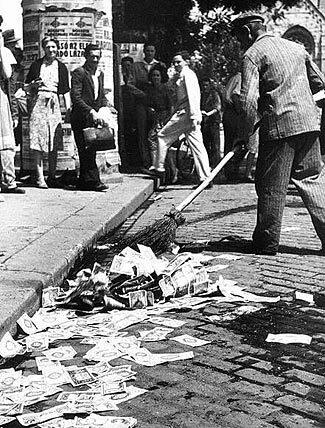 As part of the world’s worst ever hyper-inflation, banknotes were thrown away in the streets as being worthless – Hungary, 1946. This is the second of our six part series about prepping economics. An index listing the other sections is at the bottom of this article, and if you’ve arrived here directly by following a link, you might want to consider starting at the first article and then reading your way through the articles in sequence. We considered some international vulnerabilities that could impact on our domestic economy in the first part of this series, and explained how much of this vulnerability is due to our currency being a fiat currency with no underlying real value to support it. The second thing to consider is domestic risk. What happens if people within the US stop accepting the dollar as a meaningful marker of value? What happens if businesses start saying ‘We no longer accept dollars – we only accept Bitcoins or precious metals’? We know some businesses that already deal exclusively in Bitcoins or precious metals. Sure, they’re not mainstream businesses, and sure, there’s no immediate reason to think they are starting a trend that will explode to envelop the entire US economy. And, most of all, these are actions that are being taken at present, while society remains functional and in place. As for Bitcoins, we are concerned about the stability and legality of this ersatz currency, and just today (May 15, 2013) there is a news item indicating that the US Department of Homeland Security is taking action to prevent people transferring funds to one of the Bitcoin currency exchanges. We don’t know nearly enough to have a comment about the underlying legality of the Bitcoin currency, but we are unsurprised to see the US government attempting to make it difficult for its citizens to use an alternative form of currency to store wealth and trade with. Bitcoins are of course a very abstract form of money. You don’t even get any certificates to show your entitlement – everything is computer based. If the US Government shut down access to Bitcoin servers from the US, it is possible that you might have difficulty extracting your cash equivalent, and it is also possible that a concerned effort by eg the US and EU to constrain and control Bitcoin trading might see their value collapse, leaving you with little or no cash equivalent. The bigger question is what happens to the dollar if we encounter a WTSHTF type event and have to live through a Level 2 or 3 scenario? As we’ve discussed in other articles in our series on the economy after TEOTWAWKI, one of the almost immediate impacts of any WTSHTF event will be a massive change in the current balance between goods available for sale and money available to pay for them. At present, we have a more or less balanced situation where there are sufficient products for people to buy when they need them, so the buyers of goods are happy; and there is sufficient money available for people to pay for the goods they buy, so the suppliers of goods are happy, too. Any change in this balance will be very disruptive, causing prices to either skyrocket or plunge. This is not just abstract theory. We see it regularly every year with seasonal items like fruit and vegetables – prices go up and down with availability. We’re also seeing it at present (and now for five months solidly) with the run on firearms and ammunition, the massively increased prices, and the disappearance of available items to buy. Very quickly after TSHTF, the supply of goods will dry up and disappear, meaning that whatever inventory of products remain will skyrocket in price/cost/value. We will suffer a period of hyper-inflation, in other words. One of the typical adjuncts to hyper-inflation is that the citizenry seek other forms of storing value, rather than in unreliable currency which buys less and less product every week, every day, and sometimes, in extreme cases, every hour. Imagine a situation where you phone your local store and are told that potatoes cost $10,000 a pound, but when you get there half an hour later, you find the price has increased to $12,000 a pound, and while you are arguing about the price rise with the store manager, the produce department manager comes out and replaces the $12,000 a pound sign with a new sign showing $13,000 a pound. Imagine a situation where hundred-dollar bills have so little value that you use them for toilet paper, because real toilet paper costs more than $100 per piece. Imagine a situation where you literally need a wheelbarrow to take your money to the store to buy food. These situations are, however, not imaginary. They have happened in past hyper-inflation periods, particularly in Germany after World War 1 and Hungary after World War 2, but also in many other countries. The best known example was in post WW1 Germany. This was not the most extreme case of hyper-inflation, but is probably the best known. In Germany, the price of gold increased by one trillion times in six years. That’s a concept that is impossible to fully comprehend. Imagine, six years ago, that you put a penny in a bank. In our current situation, today that penny would still be worth right around a penny. Try to comprehend if that penny was now worth $10 billion dollars. Or, to look at it from another perspective, say that six years ago you had a total net worth of $500,000. That’s nice to have – you’re not a gazillionaire, but you’re not poor either. After inflation like in Germany, today your $500,000 would be worth literally nothing. Less than one ten thousandth of a cent. Heck, imagine you were Bill Gates, with a net worth of perhaps $25 billion six years ago. Your fortune today would be reduced to 2.5 cents. The worst month during Germany’s hyper-inflation was October 1923, when prices were doubling (and money was halving in value) every 3.7 days. But don’t think hyper-inflation was only something that happened a long time ago, and could not happen in today’s world. In addition to less extreme inflation, which remains commonplace, hyper-inflation has occurred in many other countries, subsequent to the German experience. Strangely, nations and their economists and politicians seem unable to learn from the lessons of Germany. In Greece, in October 1944, prices were doubling every 4.3 days. Now move closer to the present day. In July 1946, prices were doubling every 15 hours in Hungary. In January 1994, prices were doubling every 1.4 days in Yugoslavia. And in November 2008, prices in Zimbabwe were doubling every 24.7 hours. Here’s a fascinating table of notable periods of hyper-inflation. On last thing about hyper-inflation. We said above ‘Strangely, nations and their economists and politicians seem unable to learn from the lessons of Germany’. There’s actually a more sinister point here. Countries do understand how to prevent hyper-inflation, and they also understand how to create it, and sometimes hyper-inflation is a cynical and deliberate act on the part of a government, to variously redistribute and destroy wealth, and to nullify all debt. There’s a second – and opposite – part to the economic impacts from a WTSHTF event. But we don’t think the two opposite effects will balance out, rather they’ll contribute to a total breakdown of our current economic system. The chances are that most of the money you have is not in the form of cash and coins. It is stored in a bank account, or maybe represented by a balance in a 401(k) or other retirement account, or in the form of bonds and shares. Normally you could cash in or get a loan against your 401(k) account, you could sell shares and bonds, and you can withdraw cash from your bank – things you can conveniently do, whenever you like. Most of all, just about anything you buy and pay for could be done with a debit or credit card, or – worst case scenario – with a check. Many of us live in an almost cashless society these days – we don’t get paid in cash by our employers, and we don’t in turn pay cash for most things we buy. How will this work after TEOTWAWKI? All electronic and abstract forms of money will fail, because there will no longer be the functional computer networks to support them. If a tree falls in a forest, does it make a noise? More importantly, if the computer data recording the balance in your bank account disappears, do you still have any money! Maybe you’ve seen what happens if a store loses power at present. Typically they’ll stop selling goods, because their cash registers stop working and they can’t ring up the sales. Smaller stores with simpler cash registers and without an integrated online inventory management/re-ordering system might still agree to sell you something, but only if you can pay cash, and only if it doesn’t have to be weighed, because neither their scales nor their debit/credit card terminals will work without power. Now multiply that by the entire country, and you’ve a huge problem. The bulk of everyone’s wealth is locked up in inaccessible abstract forms, or has been destroyed. How long could you survive if you had to pay cash for everything, and if you only had the cash that you have with you right now – you could not get more cash from any sources? This is a mutual shared problem. You want – you need to keep buying food and other essentials. At the same time, the people with things to sell still want to sell them, but if no-one has cash to pay for them, what do they do? This is the point where future-tellers predict we’ll see two different solutions. The growth in bartering, and the use of precious metals (or something else) as a replacement currency. In fairness, not all these problems would be avoided if our currency were representational rather than fiat based. Sure, the value of the currency compared to other world currencies might be more fairly based, and definitely inflation would not be nearly such a problem, but these are only small parts of the disruptions and problems that will occur if society fails. We’ll still have the biggest two problems – a collapse of manufacturing and distribution meaning that goods we need are no longer being made in sufficient quantities and can’t be shipped to us, and a loss of functionality for all electronic forms of cash. So, whether our dollar continues to be fiat based (as it surely will be) or even if the government were to make it representational again, the biggest economic problems WTSHTF are unavoidable (for the country as a whole – you can individually act to minimize their impact on you), no matter what. Hyper-inflation is possible when you have a fiat currency, but not so possible when your currency is representational (see part 4 of the series for definitions). Although inflation adds zeroes to the currencies every month or so when countries were struggling with hyper-inflation, the underlying relative values of ‘real’ things remained much the same. A loaf of bread was always worth about the same as a dozen eggs. An ounce of gold would consistently buy so many chickens, and so on. People who store their wealth in fiat money lose every time the fiat money is devalued by inflation. With even modest amounts of hyper-inflation, billionaires become paupers. You can protect yourself against the ravages of inflation by storing your wealth not in fiat currency, but in things of real value – either goods and supplies and stores, or possibly precious metals. Keep as little fiat money ‘cash’ as possible. Store everything else in things of value – things that will either help you to survive, or things which can be used in trade. One last interesting thought about hyper-inflation. People who own money – whether in cash or in bank accounts – typically lose due to the money declining in value. People who owe money typically profit greatly because the value of the sum they owe declines down to nothing. For example, if you have a mortgage on a house, the value of the house will stay constant, but the value of the mortgage will drop and drop down to almost literally nothing. Maybe it is a good idea to be ‘cash poor and asset rich’.